First, we’re all safe here in the Yokohama area. The worst that we’ve had to contend with is the possibility of rolling power blackouts, which pales in comparison to the horrendous scene a few hundred kilometers north of here. The earthquake was certainly felt here, and we continue to feel regular aftershocks. I have photos of some of the damage in Yokohama here, but overall, we’ve been incredibly lucky. My heart is with the people of northern Honshu. My most reliable source of information throughout this catastrophe has been Twitter. 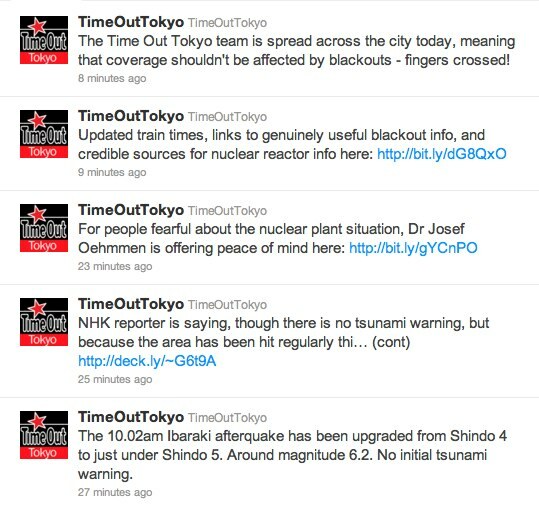 There are a few sources there, including TimeOutTokyo (which is normally an entertainment and restaurant review source), that have been absolutely fantastic with providing very current English information about the situation. For those of us who can’t speak Japanese, this has been incredibly valuable, and I am very thankful for those who are working tirelessly to get this kind information out. 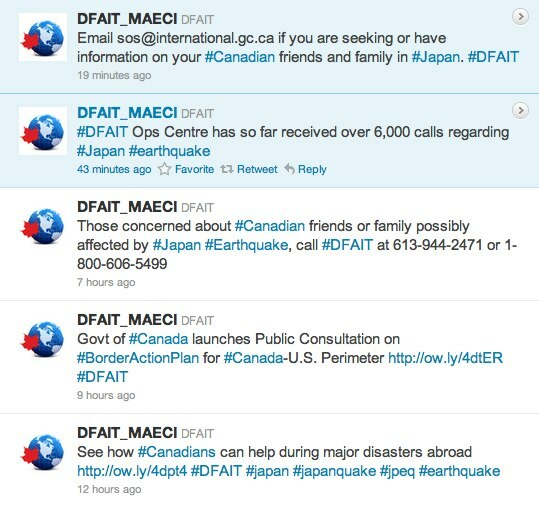 Screen grab of DFAIT's Twitter Feed. Note the time between updates. I haven’t heard it on the news DFAIT, I’ve been living in the midst of it. It seems as though you’re spending my tax dollars on garden parties at the embassy, as you’ve been proven irrelevant by a local entertainment magazine. Thanks for nothing.